So many eaux, so little temps. Though Cartier released Eau de Cartier way back in 2001, I’ve just tried it — along with the new Eau de Cartier Essence d’Orange. Cartier fragrances have never wowed me (I’ve only owned one: 1981’s Santos…and that was a gift), so I was hoping Eau de Cartier, and especially Essence d’Orange (I’m an orange fiend), would be “bright spots” in the Cartier perfume line-up. Eau de Cartier opens with a burst of wonderful yuzu “juice,” violet leaf (diffuse and watery) and, if you pay close attention, lavender (more herbal than floral) with a hint of licorice. Eau de Cartier has an indistinct, vaguely sweet, floral-talc dry-down with only a touch of musk and a clear, slightly salty, amber note; this is a very light fragrance with minimal sillage. Eau de Cartier started its “life” marketed to women; it’s now sold as a unisex fragrance, but it does smell more feminine than masculine to my nose. Essence d’Orange starts with a smooth, opaque orange aroma (not the juicy, tangy orange accord I was hoping for); the soft, “pastel” orange note blends nicely with a quiet violet accord (acacia is not distinct to me). In mid-development, Essence d’Orange has an “orange-flavored-baby-aspirin” scent, and any cedar/patchouli is diluted to the point of invisibility…one thinks…till an orange-tinged amber emerges late in Essence d’Orange’s development and intensifies on skin. This patchouli-rich, powdery amber accord makes Essence d’Orange more of a fall-winter scent than a spring-summer fragrance. I love powdery aromas. I enjoy the scents of: incense ash; rich, gooey amber turned to dust; dry sandalwood; pungent citrus juice and peel reduced to talc. What I don’t like are “polite,” “beige,” sheer (and ever-so-tasteful) powder aromas that smell like make-up. Unfortunately — for me — Eau de Cartier and Eau de Cartier Essence d’Orange fall into this “scented-cosmetics” category. Eau de Cartier was developed by perfumer Christine Nagel, and is $55/85 (50/100 ml); Eau de Cartier Essence d’Orange is $85 (100 ml). Yes, so little temps, lol. Thanks for the reviews – I’ve often wondered about these myself, esp. the orange. They seem test worthy at least, but I’ll put them lower on my list. Now… we need a review of the KenzoFlower la Cologne! To see if that is a muddled mess or great stuff. both samples coming to you Ann. AnnS: my hopes are LOW…so it may be better than expected! Kevin~ I’ve recently tested both of these and your review sums it all up perfectly. Eau de Cartier was kind of an indistinct, thin herbal scent—I’ll tell you what–to me it smells just like the herbal essences shampoo of the 80’s only lighter…. Essence d’Orange was pure orange baby aspirin…a bit tangy…but cedar and patch?? maybe in someone else’s sample but I sure don’t smell any (I dug them both out of the vile pile on my desk to retest here) It’s probably been 10 minutes since I first saw your review come up and put a few drops on the back of each hand —only spaces left that aren’t covered in Micallef Rose Aoud today—and they’re pretty close to gone now. With either one, if you loved the scent; you’d better plan on carrying a 50ml atomizer in your purse because to stay smelling this, your spritzy finger is gonna get a real workout. In the end (oh boy 12 minutes in) the Eau de Cartier has something more interesting going on than the Essence d’Orange (which is now nothing but baby aspirin dust)–but to smell either one is a nose-on-skin activity. Daisy: i drenched myself in the Essence d’Orange and the amber exploded in the dry-down. A simple dab will not get you that amber, my lady, so pour on two vials. HA! Baby aspirin?! Ugh, that makes my jaw twinge. When I worked in cosmetics retail, Eau de Cartier flew off the shelves. Everyone who liked/wore CKone in the 90s seemed to “upgrade” (price-wise, anyway) to this one. I do have to say I enjoyed the Concentrate version of Eau de Cartier. Much harder to come by but my mom loves it on my dad, so I’m trying to find another bottle in time for Father’s Day. LaMaroc: My Nordstrom was stocked with the Concentree…which seems more readily available online too…compared to the original EdC. I’m sure you’ll find a bottle. I kind of like Eau de Cartier, especially for work as it isn’t too obtrusive, but I use about 20 sprays after dressing and it’s still pretty much gone by lunchtime. The Orange version sounds like another office friendly smell, but certainly nothing earth shattering. My favorite in this category is “Gieffeffe” by Ferre, which is also light, but also interesting. Discontinued, naturally! Miss K: I took them as CANDY at home (unknown to my mother of course)…I would eat three, four,etc. My blood must have been really thin. HA! good to know wasn’t the only one sneaking a few tasty orange baby aspirin now and then! No wonder we were always covered with bruises as children!! I think you both were smarter than I was. It wasn’t so bad that I stole the yummy cherry vitamin C and ate fistfuls of it at a time, but eating the “chocolates” I found in the medicine cabinet? I don’t remember any horrible incidents because of it, but between the two of those, it’s a wonder my internal organs work at all. YOU MUST NEVER EAT THE CHOCOLATES FROM THE BATHROOM CABINET! you poor thing….I can’t even imagine…..personally I loved those Luden’s Cherry cough drops….clearly our parents weren’t watching us very closely! Daisy, good grief: I had totally forgotten about Ludens cough drops – in boxes not unlike like movie candy boxes – LOL! I also loved that cherry flavor. Mine was Aspergum – kind of tart and orangey. What was my Grandma thinking giving me that?? maybe we should all just take a moment and marvel at the fact that we LIVED! I have not been able to enjoy any of the Cartier fragrances. I almost feel like I want to like at least like one fragrance that they come out with, but it just hasn’t happened yet. I’ll have a spritz of the Essence d’Orange and see if they are able to change how I feel about them. Yeah, I really didn’t like EdC. Bought it unsniffed online at Sephora a couple of years ago, and ended up returning it (love their return policy). Something in both EdC and Mugler’s Cologne…and believe it or not, Bulgari Black totally turn me off. No idea why I throw the three of them together into one heap, but there’s SOMETHING that the three of them share that I just can’t get my nose to like. Might be the musk? Haven’t tried the orange version, but am expecting I won’t like that one either. Oh well! One less lemming. Karin: I used to love the eau de Rochas…hope it hasn’t been “fiddled with”! Don’t know what it “used” to smell like, but I bought my small 1oz bottle last year from an online discounter – smells great to me! but i do have to say, the 200ml bottles the stores use as testers are glorious. Hmmm. I don’t find the scents of lipstick or powder luxurious in the least…they just strike me as boring and uninventive. Did see the huge bottle of Essence d’Orange…very pretty. I was looking forward to Essense D’Orange, but not anymore. I owned a bottle of Roadster. I thought it was nice , but i got tired of it quickly. The others have failed to impress me. Rictor: I’m still looking for a wonderful orange for spring/summer too. I think my fun summer orange is going to be Diptyque Oyedo…it’s light and kind of sweet…just an uncomplicated happy scent….plus I’ve got this great big bottle….. If you share with everyone we can all walk around smelling like giant gummy bears together! Ok, maybe I’m the only one that got the Gummy Bear Effect when I put it on. hmmm….I’ve never eaten a gummy bear….too squishy looking…but Oyedo does remind me of those deee-licious orange creamsicles….oh god! I’m fatter just for having thought about it! Miss K: I have not tried that one. Everyone’s raving about Atelier Orange so will put that on the list for sure. I’ve been thinking about getting a bottle of the AA Mandarine Basilic after trying it for the first time recently. Really fresh orange fragrance and I didn’t get much of the basil, thankfully. I’ll have to try the Oyedo as well – sounds very nice! Odonata9: I love the Oyedo; it’s very resinous on me…like turpentine with citrus peel. A delight! Have not tried this, or I think any Cartiers. Declaration is somewhere down in my “to try” list. As for finding a good orange for summer, Kevin, maybe a nice big decant of one of the new Atelier “Colognes Absolues” would work for you… Orange Sanguine…? I just opened some samples that I’m looking forward to trying when I have some available skin: Acqua di Parma Blu Med Arancia, and the new Bergamotto. Joe: do tell me how those AdPs turn out…very curious. EdC is my go-to for those very, very hot days when I can’t stomach anything else, and as Dzingnut said, it’s very office-friendly. To me it has a kind of gin & tonic vibe. Had hopes for the Orange, but the “baby aspirin” aspect doesn’t sound promising at all. I was hoping for something more along the lines of an affordable Divine Bergamote. Rivercat: though it goes away quickly I always love a huge bottlle of Guerlain/Imperiale in warm weather. Rivercat—if you are currently looking for a bit of Bergamote to ease you thru the summer months–feel free to drop me a note at Daisyloo82 at gmail dot com . well if you like it, and sometimes I do, then the only way it has any sillage at all is to first use their EdC hydrating mist spray (occasionally marketed in gift sets, boutiques only), and then follow it with the edt. Still at best, only for very hot days, when you need just a whiff to get you out the door. LT gives it 4 stars in his Perfumes book, and I was surprised by that vote of confidence given the way I interpret his ratings. Chacun a son gout! GuerlainGuy: FOUR stars…that is surprising. But who knows if things have changed since the debut in 2001. I’ll stand up to be odd (wo)man out here… I really like EdC. To my nose, it has a sharp, bitter quality that cuts through the summer heat like few others. Unfortunately for me, I seem to be allergic to something in it, so I can’t actually wear it. I’ll probably give this new one a try, and hope I’m not allergic to it as well. boojum: that’s the strangest “endorsement” ever! HA! Eaux tend to be polite frgarances dont’t they? If you like gutsier stuff you tend not to reach for an Eau unless, as a few people above have noted, it’s high summer. I’m enjoying Kenzo’s Eau de Fleur de Magnolia – wearing it today – but it has a woodsy (or something) base, and quite good stay8ing power for an Eau. I’m wondering if there are fragrances that can be delicate and subtle, but not dull, polite and safe. AnneMarie: to be subtle and interesting is possible…I’ve worn many interesting fragrances that were on the quiet side…but many times their most interesting aspects go away fast…leaving behind the musk-wood base. Gosh, Eau de Cartier is one of my summer staples! It’s refreshing – as Rivercat said, it’s like spritzing on a gin & tonic. I’ve learned that I really like yuzu and violet leaf. I do get the lavender, and I think it adds nicely to the mix. I also think I smell violet flower. The woody base is a bit synthetic-smelling, I think, but I forgive it that. Honestly, that fragrance just sings on me, and – believe it or not – I find it to be fairly strong and lasting. I’ve actually worried about the sillage when I’ve sprayed liberally! Now, the orange one sounds like a dud. Darn! P.S. I love “So many eaux, so little temps”! And sorry. Enthusiasm persists… I forgot to say that I love the bottle design! Well, but you don’t agree on the original, so there’s no saying you’ll agree on the flanker. I’d still try it! Haunani: glad someone is speaking up for EdC…it must be popular. The Nordstrom clerk told me it’s a best seller of its type. You’re right, Boojum. I should at least try it! And Kevin, I didn’t know EdC was so popular. I’m glad there are others who enjoy it. 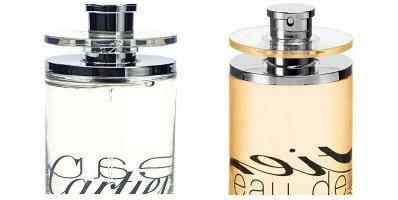 Do you prefer the eau or the eau concentree? Just came across this – waaaaay later. I haven’t tried the Concentree, because I can’t imagine liking it better than the original! Kevin, while not particularly summery, but PdN New York and Maharanih are beautiful scents with definite orange notes – worth sampling if you haven’t already. Good luck in your orange quest! Noz: I have tried, and like, the New York…but still looking for more orange! I’m a big fan of Eau de Cartier and love it on a sweltering day, especially for office wear. By the end of last summer I’d almost finished my small decant of Concentree and previously had samples of the Eau. I’ve been thinking about getting more, but can’t decide b/w the standard Eau and the Eau Concentree. I think I like the regular Eau better, but have never done a side-by-side test. Any thoughts? Both have OK (for an eau) lasting power on me. I happened to find our local Cartier Boutique has the new Orange flanker on the shelf. I think the concept stays the same, with only minor twist. The orange bottle is awesome in hand. However, what really surprised me is that I found there’s another new face on the shelf today. I cannot find any information regarding this new stuff. It’s “Declaration Cologne.” With slightly blurry green, classic declaration bottle, the scent is totally different from the original or the essence. I didn’t try the “Bois Bleu” so I cannot comment on that. It is one classic cologne with a lot of spice in it, just like the concept Declaration has. Kinda like it. Craig: if that’s the one I’m thinking of it was a limited edition scent; I never saw it on the shelves to try it. (The bottle goes from dark green-blue at the bottom to light green on top?) Supposedly it had lots of orange in it…so I would have liked to sample it. Let’s say this mysterious Declaration Cologne is more of iced lemon black tea on my skin. (Anything with tea concept should be with a lot of spices I guess.) And the bottle is with a consistent blurry green bottle all the way. After I rechecked with the SA in Cartier earlier today. The “Declaration Cologne” with blurry yellowish green is a brand-new edition of “Declaration Family.” It’s just the information hasn’t been updated on the website. Craig: Thanks…anything with a tea vibe interests me. I adore Eau de Cartier, and find it is the only scent I can wear when hungover. It smells so pure and therapeutic. I keep mine in the cool shade and it stays beautiful.